Town defender Dan Potts believes manager John Still deserves a great deal of credit for the club’s recent upturn in form. After Hatters had begun the season by taking just five points from their opening seven games, they rectified that in some style by winning four on the bounce. Saturday’s 1-1 draw with York City made it 13 points from a possible 15 as Potts admitted any doubts the players had were always brushed aside by Still. He said: “When the results went the way they did and the luck went against us, the one person that wasn’t worried was the manager. “He’d always been coming in upbeat and to be fair at the time I’d be lying if I said you doubted the way it was going. Although Hatters have been on fire away from home in particular, netting seven goals in their last two games, a return to a solid defensive base has been an equally important element. 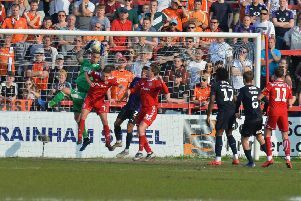 Luton have now been breached just three times in five games, as opposed to 10 in the five before that, as Potts continued: “When you concede goals, the first people you look at after the goalkeeper is the back four. “But credit to them, we kept two clean sheets on the bounce at home and the away games we’ve scored goals, whereas at the start of the season we were scoring goals, but still be losing by the odd goal. “That’s changed around and not just credit to the back four, you’ve only got to watch the whole team as the midfield work their socks off, so it’s a combined effort.